As it was a sunny afternoon and I wasn’t far from the Museum Gardens, I thought I’d make a bit of an effort to see at least the last part of the royal visit. I made the mistake of trying to approach the Gardens from the Museum Street side, where I got stuck in slow-moving traffic, of the pedestrian kind. 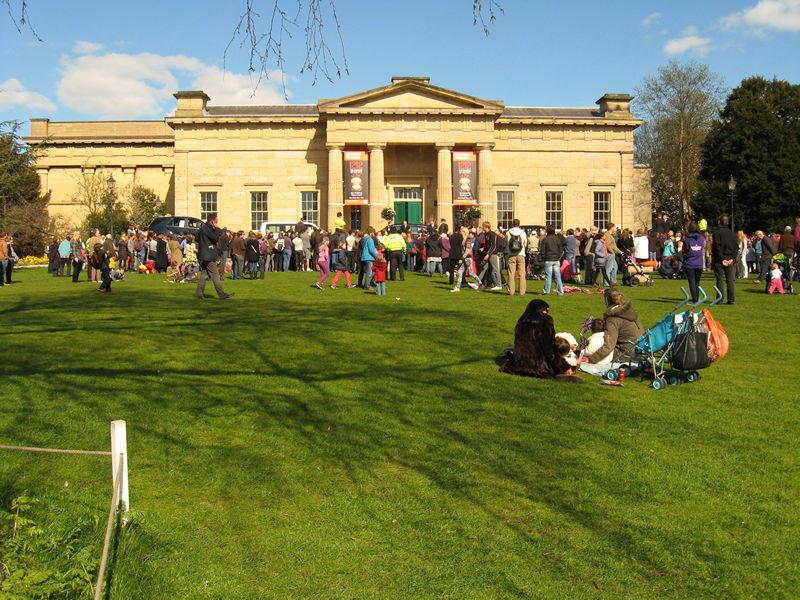 Twitter and the Press website had been useful in indicating where HM was – in the Yorkshire Museum, by then – which I was able to approach more easily from the other direction, after grappling my way down to the riverside. As soon as the royal party emerged from the museum, most of the people in this crowd raised an arm or two, not to wave or salute, but to try to get a photo, on smartphones and digital cameras. Perhaps I should have taken a photo of that, which is always an odd sight. We see so much through screens now, don’t we. While maybe not really seeing it at all. A woman I passed on the way up the path to the museum was saying to her friend how she didn’t really get a proper look at the Queen as she was ‘too busy trying to get a photo’. That’s happened to me many times too, on other notable occasions where I wish I’d just watched properly instead. 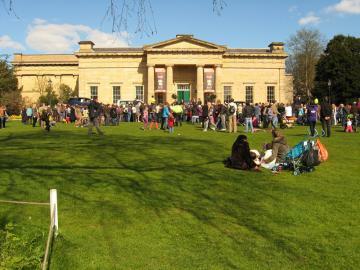 As there was a bench to sit on while waiting, and as it was sunny, the waiting wasn’t too much of a hardship. When the royals emerged and the rather dispersed crowd all crowded in closer, and got a little noisier, in a sedate and reverential fashion, I did move closer too, trying to see if I could get a better view, maybe from behind someone shorter than me who didn’t have their arm raised. The atmosphere was a bit giddy, and even an old cynic like me felt mildly affected. While they chatted to some children briefly before getting in the car, a woman behind me shared a joke with a policeman, and another man, standing at the back, shouted in an impressively resonant voice ‘God bless you, your majesty!’. Some people turned and smiled at him, others looked slightly embarrassed, someone attempted to begin a ‘hip hip hooray’ which no one else joined in with. 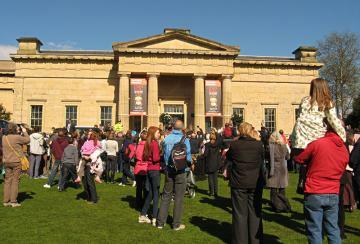 Despite a fair bit of moving from one side to the other, I didn’t get to see the Queen’s actual face. I did see the top of her hat. And later, on Radio York, heard her hat described, many times over, along with the rest of the outfit. 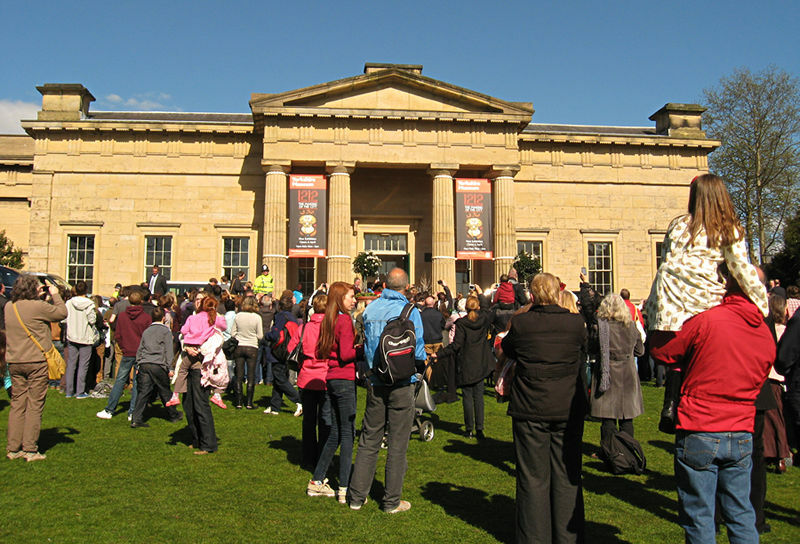 And of course, as the car pulled away towards the gates of the Museum Gardens, we all did that strange following thing, moving alongside it, en masse, with people crashing through the shrubbery in the flowerbed. I wondered why I was following, being a cynical old non-royalist type, but it’s difficult to remain unaffected by that amount of strong public feeling. It’s an over-used phrase, but you really could ‘feel the love’, and this massive wave of reverence and devotion which you felt would have had the power to propel her, had the car not been available. I did feel quite tearful at one point. But then I’m a soppy old thing. I walked back the long way round. 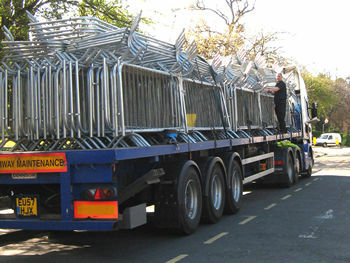 Near the station, men were stacking safety barriers away onto a lorry. The stack of metal fencing with the big wheel behind looked impressively photogenic, though my photo wasn’t impressive, and the wheel was barely visible, so here’s a photo of just the lorry. A reminder of just one small part of the work put in by many people behind the scenes, from so many different organisations, to make sure things go well. And they did. 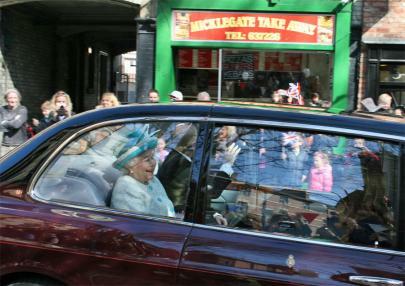 And though I didn’t see the Queen’s face, it was good to see so many other happy smiling faces. 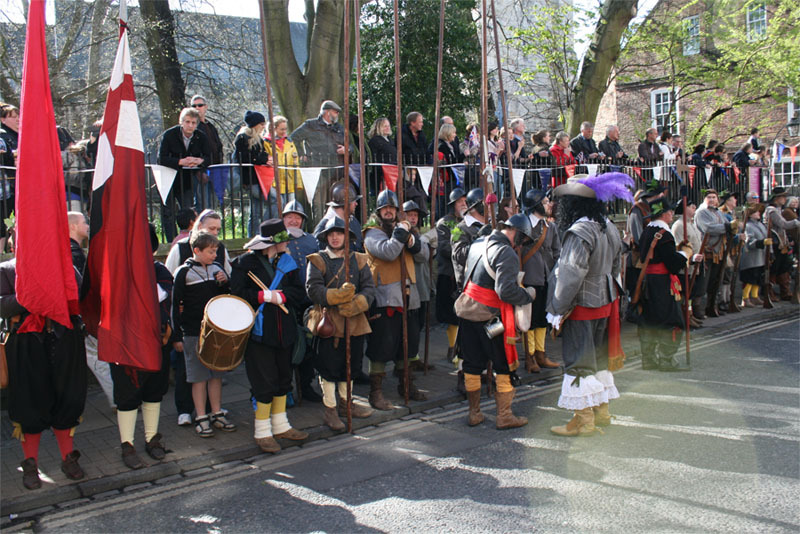 Though I arrived late in the day, the really happening place was Micklegate. I was fortunate to be there for an earlier royal visit, but not this one. 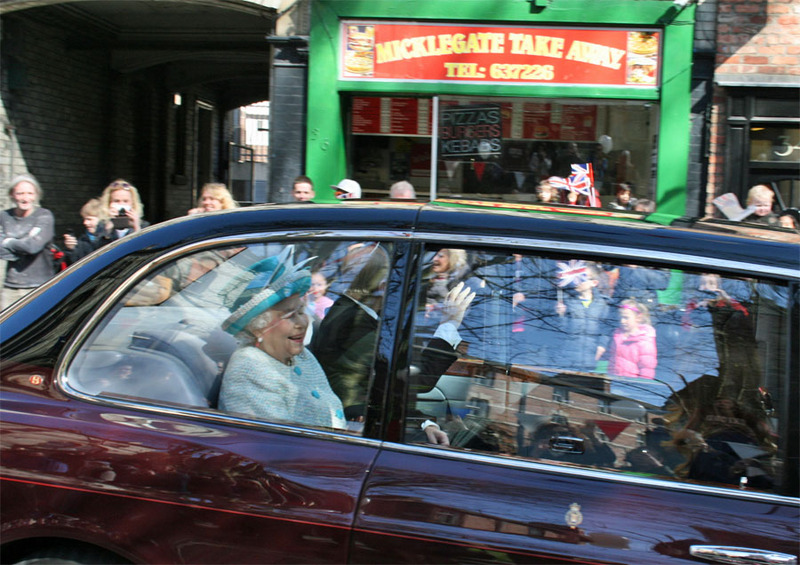 But Graeme Thomas was there, and sent me this lovely photo of the Queen and Prince Philip in their car, near the bottom of Micklegate. The Queen is laughing and looks like she’s having a great time. Which of course everyone does when they come to York. This photo, and the one below, can be enlarged. Another lovely photo showing the well-wishers lining the street, here outside Holy Trinity Church. 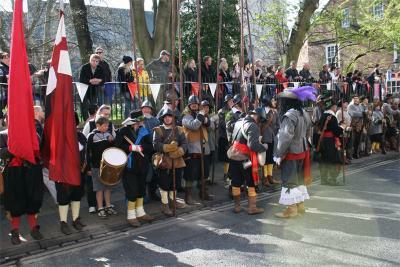 I’m guessing that the costumes are 17th century Parliamentarians and Royalists – aka Roundheads and Cavaliers. The gent with the fabulous wig and purple feathers is a Cavalier, I suspect. Looks like much fun was had by all on Micklegate. Thanks to Graeme for the record of that special day. Oh to have been there!!! last time I was running with a pram along Dalton Tce, with my baby in the pram, she is now a lady over 60!!! Prince Philip waved and stood up look back when my big pram tippled over nearly when I ran it off the pavement edge. I righted the pram and waved back and he gave me a big smile. Time flies but happy memories remain.